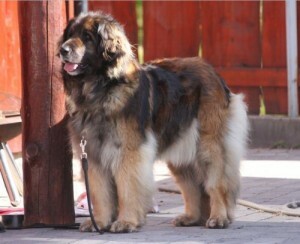 Leonberger is a dog of impressive size and elegant appearance. Although the population of many breeds was decimated during World War I, today the breed has recovered nicely. The breed is well known in several European countries, but in many countries of the world is still considered a rare breed. The background of the Leonberger is a very clouded one, full of mysteries and turbulent tales. To start at the beginning, we go back to the early years of the 19th century. In Leonberg, a small rural town 20 km northwest of Stuttgart in Wurttemberg (Germany) Heinrich Essig was born in 1809. He turned out to be a very ambitious man, and he became a very prominent citizen, elected to the town council and possessing a strong talent for marketing and trading. His greatest passion was for all kinds of animals and his house (Schweizerhaus) was more like a private little zoo, with all kinds of dogs, foxes, turkeys, peacocks and so on. This account was written of Essig’s creation of the Leonberger : “Amongst his dogs there was a black and white Newfoundland female (Landseer type). He crossed her with a longhaired Barry-dog (St. Bernard) he owned also. He crossed them for 4 generations, out crossed again with a Pyrenean Wolfhound (Pyrenean Mountain Dog) crossed again with a St. Bernard”. There is, however, no proof that this is in fact what was done and that there were no other dogs involved. Essig started breeding in 1846, which is the date we now attribute to be the birth of the Leonberger. “. . . the most interesting characteristic of the Leonberger is his lack of specialization. Although his is the body, the strength and the muscle of a typical working dog, the fact that he has been selectively bred for the balanced temperament of a house dog. . rather than for any precise working task, has gifted him with a versatility almost unique on the present canine scene. The Leonberger adapts himself well and often spontaneously to various uses; he seems to know instinctively what is expected of him.”While not the perfect dog for everyone, they are a true mix of canine strength and elegance at its best.